Have you tried for years and years to lose weight? Hundreds of diets that don’t seem to work? Your weight has been up and down and all over the place, and you just can’t figure out what you are doing wrong? After my recovery from disordered eating, I went through the same thing. I was happier than I had ever been, being able to eat whatever foods I wanted to, and for awhile I was able to maintain my weight. But after about 6 months or so, it wasn’t quite as easy. For some reason, no matter how hard I tried, I just couldn’t get a hold of it. My weight was up and down like a yo-yo. So I really had to look at my life and ask myself what the heck I was doing wrong. Am I being consistent with my workouts and healthy eating? Do I really care about getting fit and in shape? Can I really do this or am I asking for too much of myself? And that’s when it all hit me. Those three questions triggered something within me and helped me to see the missing pieces. And without these pieces, I was doomed from the beginning! So there are three roadblocks that get in your way from losing weight, and with them in your way, you won’t be able to get far in this journey to a healthy weight. We plan everything in our lives. What time we need to get up in order to get to work on time. When we need to get an oil change. What days we do the laundry. We know that in order to succeed in every other part of our lives, we must make a plan. Why should it be any different for weight loss? We must plan for losing weight. I use my Erin Condren Life Planner and make sure to plan each and everything into my day. What time I’m going to workout. What I’m going to do for my workout. What I’m going to eat. When I’m going to eat it. I try my best to plan the day before, so when I wake up the next day, I am ready to get to work and there is no chance to put it off. We say our health is a priority in our lives, but often we aren’t honoring that priority. We are not living it. For the longest time, I was telling myself and the world that my family was one of my top priorities, and they are! But as an outsider looking in, that did not appear to be the case. I would spend 60+ hours a week working. I was often found with my laptop in front of my face. I would spend game-night checking my phone for social media updates. It just wasn’t apparent at all that my family was a priority. I know it’s sad, but it’s the truth. So I want you to really think about your priorities. Where do your health and fitness goals fit in? I sure hope they are in the top 3 of your priorities. My health is my number one priority because without my health and well-being, I cannot be anything else. 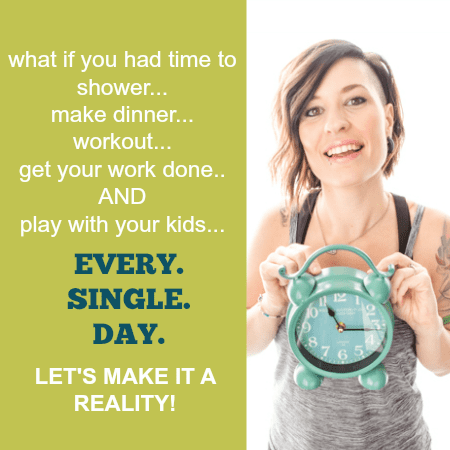 I cannot be a good wife, mom, or business owner unless I am taking care of my body. Once you start to prioritize your health, you will see that other things won’t matter quite as much. You won’t feel the need to watch trash tv because it’s not as important as your health. You won’t feel the need to snooze through your alarm clock because you know that getting up for your workout is more important. You will be able to say no to junk food because your health is a priority! For the longest time, maybe for years even, there have been influences that have been telling you that you’re not good enough. That you’re not strong enough to lose weight and get healthy. That you’ve always been a bigger girl and that’s just how it’s meant to be. Let me tell you that is just not the case! Media. Friends and family members who may not support you. The negative voices in your head. These are all influences that we need to kick out of our lives. They are getting in the way of our success! Once you kick out the negative, you are able to let in the positive. You are able to tell yourself that you are strong. You are capable. You can do hard things. You can conquer this! And then I want you to tell me down in the comments, because although there is power in telling yourself, there is more power in telling someone else. Because then you actually start to believe it! And that is an amazing feeling. These are the 3 Roadblocks that are getting in your way of a healthy and happy life! Those are the major roadblocks. Those are the 3 crucial obstacles that you must push out of your path on the way to a healthy and happy life. With those in your way, you won’t get far. You may know exactly what to eat and when to eat it. You may know the best exercises. But with these three roadblocks in the way, they won’t do you any good. Looking for more tips for getting healthy and happy?